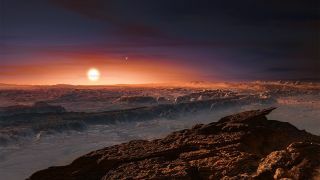 This image is an artist's impression of the surface of the planet Proxima b, which orbits a red dwarf star called Proxima Centauri — the closest star to the solar system. The new findings suggest Proxima b could have a large liquid ocean covering its entire surface and stretching 124 miles (200 kilometers) deep, as well as a thin gas atmosphere much like that found on Earth. These features favor the planet's potential for supporting life, according to the statement. Scientists have proposed different ideas about Proxima b's composition and surface conditions, and the new models provide more information that could help inform those ideas, NASA officials said in the statement. Some of those ideas "involve a completely dry planet, while others permit the presence of a significant amount of water in its composition," according to the statement. Using the planet's known mass (1.3 times that of Earth), the authors of the new research simulated different potential compositions for Proxima b and then estimated the radius of the planet for each of those scenarios. The study revealed that Proxima b could have a radius anywhere between 0.94 and 1.4 times that of Earth, according to the NASA statement. For one of the potential composition models, the researchers found Proxima b may be an "ocean planet" similar to some of the icy moons around Jupiter and Saturn that harbor subsurface oceans. In this water-world scenario, the planet would have a radius of 5,543 miles (8,920 km), which is 1.4 times the radius of Earth. It would be composed of about 50 percent rock and 50 percent water. The pressure beneath this massive, deep ocean would be so strong that a layer of high-pressure ice would form, according to the NASA statement. Another model developed in the study suggests Proxima b would have an internal composition similar to the planet Mercury, with a minimum radius of 3,722 miles (5,990 km), or 0.94 times the radius of the Earth. In this scenario, the planet would be incredibly dense, with a metal core accounting for 65 percent of the planet's mass. The rest of the planet would be composed of a rocky silicate mantle, and liquid water oceans accounting for less than 0.05 percent of the planet's mass (similar to that seen on Earth), according to the statement. However, ultraviolet and X-rays from Proxima Centauri could leave the water on Proxima b prone to evaporation. To account for this, the researchers also calculated the radius of Proxima b with a completely dry composition. "Future observations of Proxima Centauri will refine this study," NASA officials said in the statement. In particular, by measuring the abundance of certain heavy elements in the star system, scientists can further deduce the planet's likely composition, and its radius. The study findings will be published in The Astrophysical Journal Letters.